Expedition 329 ended on schedule when the first line was passed ashore at Wynard Wharf in Auckland, New Zealand at 0636 hr on 13 December. This also marked the beginning of Expedition 330 (Louisville Seamount Trail). 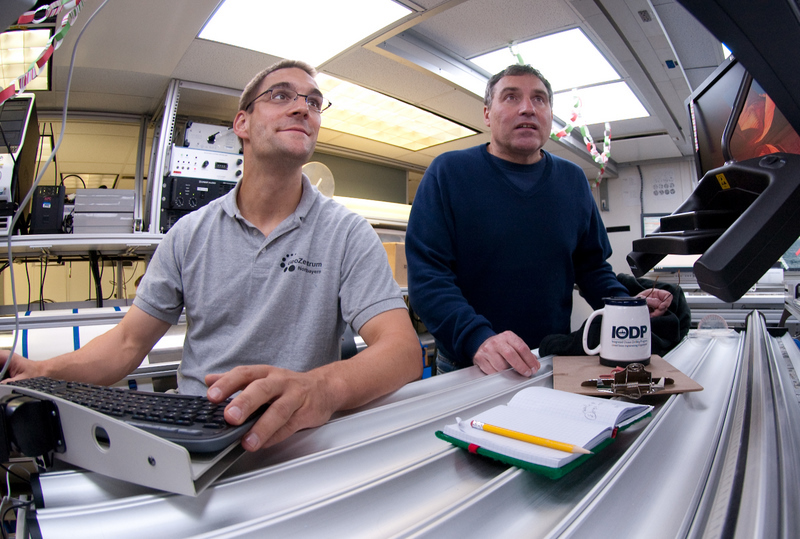 Both ODL and IODP crews were changed subsequent to the conclusion of immigration and custom formalities. In addition to the usual routine of loading and unloading supplies, there were extensive tours of the vessel for visiting dignitaries and VIPs, scientist interviews with reporters from the local media, and interaction with senior representatives from the Auckland Museum. There were several outstanding maintenance items addressed during this port call as a result of incidents that occurred during the previous expedition. The defective field coils in Propulsion Motors 14A, 14B, and 18A were replaced with rebuilt units and repairs affected to the I/O modules of the dynamic positioning system acoustic processors. A pacing item during the port call was the replacement of the damaged aft piston rod on the passive heave compensator with a spare unit. This labor-intensive activity continued through the entire port call. Another important issue required the offloading of the entire inventory (22 units) of 20-foot and 30-foot knobbies to dockside. Critical dimensions were then measured and compared with the clearance requirements of the 430-ton and 250-ton elevators used on the drill floor. Once an upper level of acceptable outer diameter was established, the tubular measurements were analyzed. It was determined that four knobbies had to be transported to a local machine shop (Titan Marine) where the outer diameter would be reduced to conform to specifications. These tubulars will be retrieved at the conclusion of Expedition 330. The last port call item of note was the loading of 1450 MT of marine gasoil which was completed at 0035 hr on 18 December. The scheduled departure to the first site of the leg was delayed 1.5 hours when the scheduled tug had to divert to assist an arriving cruise ship. The last line was released at 0806 hr on 18 December. Once the pilot disembarked at 0912 hr, the vessel began the 820 nmi transit to Site U1372 (Prospectus Site LOUI-1C, the second northernmost seamount of the Louisville chain). As of midnight on 19 December, the JR has transited 422.0 nmi at an average speed of 10.9 knots. The E.T.A. at Site U1372 is 1600 hr on 21 December. 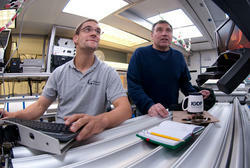 IODP Expedition 330 aims to contribute to our understanding of mantle plumes and geodynamic Earth models. Hotspot volcanism is generally considered as the surface expression of mantle plumes and hotspots that are assumed to be geographically fixed in relation to each other (thereby forming linear, age-progressive hotspot tracks on the overriding plates). However, drilling during ODP Leg 197 in the Hawaiian-Emperor seamount chain documented a large ~15° southward motion of the Hawaiian hotspot prior to 50 Ma, calling into question whether hotspots constitute a fixed frame of reference. The Louisville seamount trail is a 4,300 km long volcanic chain that is inferred to have been built in the past 80 Myr as the Pacific plate moved over a persistent mantle melting anomaly or hotspot. Because of its linear morphology and its long-lived age progressive volcanism, Louisville is the South Pacific counterpart of the much better studied Hawaiian-Emperor seamount trail in the North Pacific. IODP Expedition 330 aims to core similar old seamounts as drilled during Leg 197, to constrain if the Hawaiian and Louisville hotspots have moved in concert or independently from each other. The results will show if both hotspots can still be used as a (moving) reference frame for modeling plate motion in the Pacific or if the textbook idea of relatively-fixed hotspots is further challenged. Additional objectives of this expedition include investigating the geochemical evolution of individual Louisville seamounts including subsidence history, determination of their magma source composition and temperature as well as magma fractionation and eruption history. In addition, any intervals that are recovered from the thin pelagic sediment cover will provide a valuable contribution to high-latitude southern ocean climate reconstruction. This expedition also sails a microbiologist who will investigate the microbial activity in the basement rocks. The scientific party arrived on board on 14 December. They spent the first week of this expedition familiarizing themselves with their laboratories, instrumentation, documenting methods, and practicing core flow and sampling procedures. They also received a comprehensive training in DESClogik, the new application for entering descriptive data into the ships database via specific templates (excel-like spreadsheets). By the end of this week, the respective templates for each descriptive lab group (sedimentology, petrology, alteration, structure) and the biostratigraphers are largely set up or are in an advanced state. The core describing groups used core sections from ODP Leg 197 that are available on board to practice core flow and description in DESClogik. In addition, shipboard sampling strategies and core flow were discussed and approved by the curator. By the end of this week, most lab group submitted their first draft of the “Methods” chapter (explanatory notes) for the cruise report. All scientists met with the curator, co-chief scientists and the expedition manager for a first meeting to discuss post-cruise research. A coordinated sampling and research plan was hammered out and is supposed to be agreed on during an upcoming meeting. 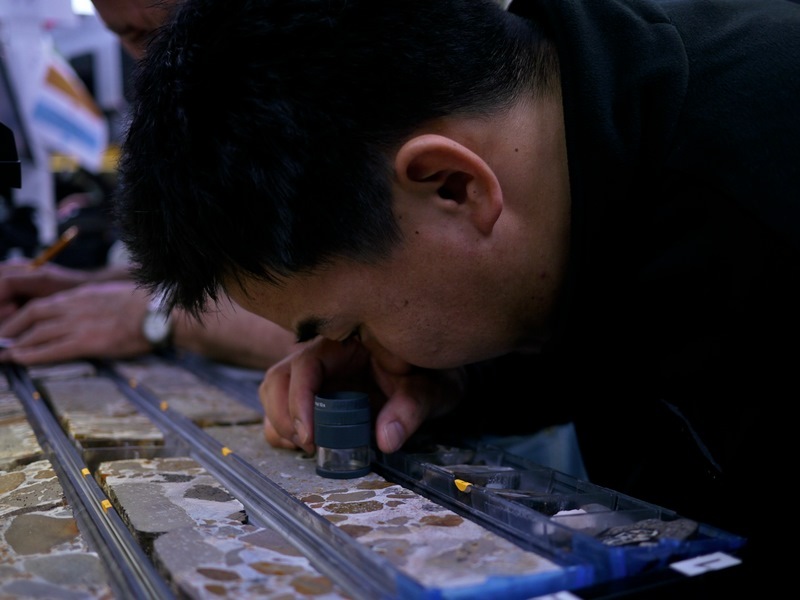 All personal sampling of igneous and sedimentary cores will happen during two or three sampling parties, which will be conducted during the expedition. The expeditions education officer started blogging and posting pictures and the expedition videographer took footage of departure and preparation procedure and conducted interviews. During the Auckland port call, technical staff offloaded science materials from the previous expedition and resupplied the shipboard laboratories. While on transit to our first site, the following activities were completed. Science party and new technical staff attended the Captain’s Safety talk and participated in the Laboratory Safety tour per TAMU Hazardous Communication policy. The weekly fire and boat drill was held as scheduled on 18 December.